Flatliners has an obviously intriguing premise, albeit one that doesn’t immediately grab you as a horror hook: just what happens when we die? We’ve all heard the stories involving bright lights, tunnels, and vaguely angelic presences comforting us as our lives flash before our eyes, but the truth is this question has haunted mankind for ages. Perhaps we like to think death will be a comfort because the truth is much more unsettling—or at least that’s what the folks behind Flatliners supposed when this eternal question was twisted into the stuff of nightmares. What if courting—and cheating—death only opens the door to the utterly repressed horrors of your own life? And, better yet, what if someone explored this notion with a cast of hot 90s stars with Joel Schumacher at the helm? On its face, it’s not a bad idea, and Flatliners introduces itself with bravado: a camera dramatically swoops and swings through Chicago (courtesy of photographer extraordinaire Jan de Bont) before zooming in on Nelson Wright (Kiefer Sutherland), a medical student surveying the cityscape from a rooftop. “Today is a good day to die,” he intones, leading you to wonder if you’ve just actually just watched the opening scene to a bombastic 90s action movie. Say what you want, but it’s a hell of a way to open what is ultimately a rather intimate tale that finds Nelson recruiting his fellow medical students to conduct an experiment to determine what actually lies beyond death. In order to collect data, Nelson induces a clinical death before he’s resuscitated, at which point he returns with tales of bizarre visions. Something is there, he insists, though he isn’t certain what. Soon, his fellow students are tripping over themselves in an effort to follow him, essentially daring each other to push further into the afterlife. Boundaries are pushed with each new trip into the beyond, which yields blissful and disturbing imagery in equal measure. However, it’s the latter that lingers when they return to the land of the living, as each student is haunted by repressed or forgotten sins. Nelson in particular suddenly finds himself literally terrorized by the spirit of a dead boy from his childhood, something he’s hesitant to reveal to his colleagues, lest they interrupt his deranged pursuit of secrets mankind is never meant to know. Flatliners feigns at that tired old moralizing chestnut: “don’t play god,” it half-heartedly warns, perhaps because it knows you’ve heard it before. And, to its credit, it barely attempts to posture at this: obviously, it’s inherently another parable about pushing the limits of science and knowledge, so it doesn’t find the need to dwell on it. Instead, Flatliners mostly exists to deliver a series of repetitive scares and suspense sequences in its effort to figure out just what exactly it is about. 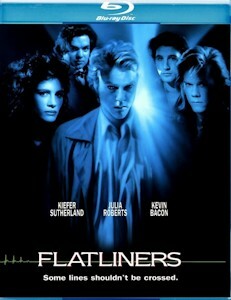 Screenwriter Peter Filardi definitely had a hell of a pitch to get him into the room; I’m not quite sure he really had enough for a fully-formed movie, though, as Flatliners wanders about a bit aimlessly during its overlong 110-minute runtime before eventually settling on a weirdly sentimental, almost schmaltzy note. Near-death experiences here eventually become a means of exploring and atoning for one’s own guilt and sins, which, quite frankly is fine, if not somewhat unexpected considering its initial spook-a-blast ambitions. Also fine: hitching this rickety script to the likes of Schumacher, who frequently excels at molding clever hooks into slickly produced entertainment. Flatliners is no exception: while its script does meander before arriving at its point, Schumacher’s sensibilities shuffle the film along at an amiable pace. His heart is especially invested in the afterlife and overt horror sequences, which he infuses with a dazzling style. Because the script calls for each student’s afterlife experience—and subsequent haunting—to be different, the film becomes an open palette for Schumacher to explore various stylistic tics. Some of the sequences resemble overwrought Dior commercials; others capture a legitimate nightmare logic that jumbles up memory, regret, and fear into potent, affecting sequences. Schumacher is rightfully indulgent here. With the script struggling to arrive at its meaning, the director goes for broke in an attempt to distract the audience with overblown scenes that exploit the premise for all its aesthetic possibilities. When the group conducts one of its experiments on Halloween night, it takes on the tenor of some otherworldly ritual. Costumed revelers party away outside, oblivious to the unholy experiment unfolding within an abandoned building, where the line between the living and the dead is appropriately crossed on All Hallows Eve. It’s a small detail that adds the perfect Gothic atmosphere, helping to usher this wobbly story to its threshold. Maybe it never arrives at anything profound, but it does feature some rad creepy kids and unrested fathers, collected here in obvious backlot sets that heighten the film’s surreal, almost dreamy quality. You sometimes feel like you’re trapped in this nightmare alongside the characters, particularly when the line between life and death begins to blur. Obviously, this stellar cast also helps to make Flatliners compulsively watchable. It often (wisely) leans on the magnetism of the sheer charisma on display from Sutherland and the supporting players. In fact, it might be a disservice to refer to them as supporting cast members considering how well the characters are fleshed out and brought to life by these actors. Kevin Bacon matches Sutherland’s vaguely Byronic bad boy with a terrific turn as Dave Labraccio, a good-hearted student who knows his limits and eventually pushes back against the out-of-control experiment. Caught between the two is Rachel Manus (Julia Roberts), a student driven by the traumatic death of her father to learn the secrets of the grave. Rachel is the halfway point between her male counterparts: she’s just as driven as Nelson but has Dave’s conscience. Where Nelson seeks fame and fortune, she endures the experiment to reconnect with a lost loved one, a noble pursuit that’s twisted along the way as dark forces encroach upon her. Between this characterization and Roberts’s plucky performance, Rachel serves as the heart of Flatliners—or at least she should. It turns out that the impressive cast—which also boasts William Baldwin and perpetual smartass Oliver Pratt—also undermines the story’s structure. Everyone (save Pratt, whose character never undergoes the experiment) features in their own arc, which feels correct but winds up feeling a bit repetitive and episodic. Despite their individualized hauntings, the process somehow deflates as it goes along: you hold your breath for the students the first couple of times they go under, wondering if they’ll be pulled back from the brink of death. By the end, though, it feels like a matter of course. So too does the story, which settles on making Nelson’s quest for atonement as the story’s climax pretty much by default: in fact, most of the other characters’ subplots (save for Dave’s) are all but dropped, resulting in a hasty, sloppy conclusion that doesn’t stick the landing. When tasked with exploring its Big Question, Flatliners balks: it’s not here to offer any grand answers, and even its sermonizing feels like posturing since the film feel much more concerned with being cool as hell—and that’s okay. Maybe Flatliners isn’t a sacred text (despite its status as a 90s video store staple--I swear one place around here kept its poster up for years), but it is a fun ride that leaves some room for improvement, which is why I’m not particularly fussed over the upcoming reboot/sequel. After 27 years, perhaps someone has come up with a satisfying direction beyond the general pitch, one that will allow the premise to cohere into something completely satisfying—provided they can pick up the beat, of course. Even though Flatliners has been popular enough to linger in the public consciousness and warrant a remake, it’s been practically ignored on home video over the years. Sony has dropped the film not once but twice on Blu-ray, with the second arriving via one of those cheaper Mill Creek releases, which speaks volumes about its treatment. Not a single special feature graces either release, and the presentation is adequate at best. You get what you pay for, which in this case isn’t much anyway (and rightfully so). With a new film looming, one would have hoped for some kind of stellar re-release; instead, Mill Creek is only offering a new steelbook effort that houses the same old disc. Maybe they’re prepping a more impressive release to bow when the redux hits home video, but I’m not exactly holding my breath.